I must agree that Malaysia, my home ground is FOOD HEAVEN. One can get varieties of food here. Recently, CNNGo explored on “World’s 50 most delicious foods” – Some foods you eat to stay alive, others you eat because not to would be a crime. And they came out with a list of food worth eating. Some are still debating on the results, some aren’t satisfied with the result either. I am so proud and delighted that Malaysia’s Penang Assam Laksa ranked at No.7! CONGRATULATION to Assam Laksa! Anyway Assam Laksa is always my favorite. Just couldn’t resist the spicy & sour soup noodle. Take a look if your country’s famous food falls under the Top 50 list. ***Dear readers, please share your favorite Assam Laksa spot here. Ah Yi! 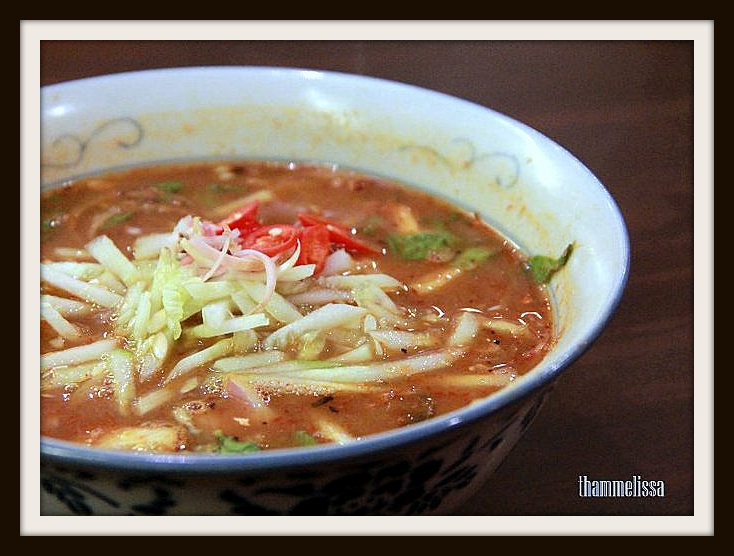 Quick make an appointment to perm your hair lo…then u can go back Penang to enjoy the yummy assam laksa!! hahaha…. Haha.. My mom is flying there on the 7th.. But I not going le.. Sigh… Cos this weekends got plan Liao.. Weekday kong dun wan go..